"With less than six weeks to go before Election Day, Latinos across the country are still being ignored,” said NALEO's Arturo Vargas. "Time is running out." 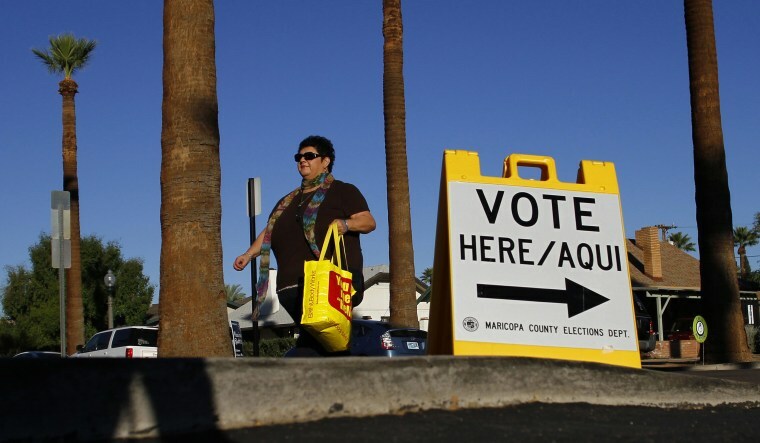 Six out of 10 Latinos surveyed nationally told pollsters they had not been contacted by a candidate or political party to register to vote for the fast-approaching midterm elections and faster-approaching voter registration deadlines, according to results released Thursday. Polling firm Latino Decisions has been conducting a tracking poll for the bipartisan National Association of Latino Elected and Appointed Officials (NALEO) to gauge over several weeks the level of Latino voter enthusiasm and their preferences in the first major election since President Donald Trump won the presidency. The latest results from the third week of polling, conducted Sept. 8-17, show 60 percent of Latinos said they had not been asked by a political party, campaign or organization and asked to register to vote or to vote by mail, email, text, while out in the community or by someone knocking on their door. That is about the same share who reported no contact in the first week, Aug. 8-Sept. 23 and the second week, Sept. 5-10, of polling. "With less than six weeks to go before Election Day, Latinos across the country are still being ignored,” Arturo Vargas, NALEO Educational Fund CEO, said in a statement. "Time is running out." There are about 27 million Latinos in the country who are eligible to vote because they are 18 or older and U.S. citizens. But for about a couple of decades, more Latinos have not voted in presidential election years than voted, according to Pew Research Center. In 2016, 12.7 million Latinos voted compared to 14 million who didn't, the center reported. Turnout for all voters is generally lower in the midterms than in presidential election years. There has been some expectation that the election of President Donald Trump and his rhetoric and policies, particularly regarding Latinos, would spur greater registration and turnout among Democratic voting Latinos. However, other Latino Decisions polls have shown that while Latinos are frustrated and angry over Trump, that emotion has yet to result in a highly-motivated electorate for Democrats. Latinos are more likely to vote Democrat, but the growth of the Hispanic electorate in some congressional districts has made winning Latino votes more necessary for some Republicans. From Democrats' lips to Latinos' ears: Is the message getting through? Republican voting Latinos were slightly more likely to say they were contacted by a campaign than not, 52 percent to 48 percent. Democrats were more likely to say they were not contacted, 57 percent to 43 percent, suggesting the party is contacting more people who have voted in previous elections than those who have not. However, among Latinos who were contacted, 51 percent said they were reached by someone from a Democratic campaign or party and 32 percent said they were contacted by someone from a GOP party or campaign. Twelve percent said they were contacted by a non-partisan group. When broken down by geography, the Democrats seem to be making greater progress in some areas than others. For instance, among 68 percent of Latinos in the New York-New Jersey area who were contacted, said Democrats had reached out to them. However, only 45 percent of California Latinos who had been contacted by a Democrat. The NALEO Educational Fund/Latino Decisions Weekly Political Tracking Poll completed September 8-17, 2018 has a margin of error of +/- 4.4 percent. The pollsters add 250 fresh interviews each week so there is a rolling average of 500 for each week, which Latino Decision said is a methodology that is consistent with most tracking polls.